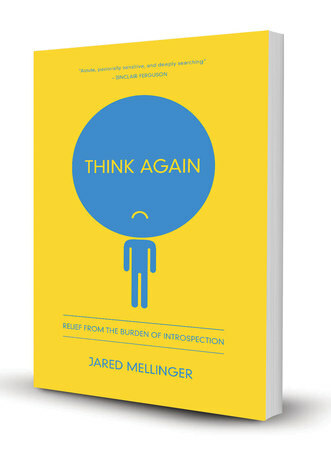 Jared Mellinger believes we have gotten a little carried away with decades of media focused on helping us understand ourselves. We are spending so much time looking inward, we are forgetting to look upward. Mellinger encourages us to ease up on the introspection and trust in our creator. Starting off the book with a somewhat humorous example of human error, Mellinger shows us how quickly and easily we can become self absorptive and miss the greater picture. Mellinger discusses our deep seated need to overdo self-love and self-loathing. He cites the extreme examples of Narcissus from Greek Mythology and Dolby from J.K. Rowling’s popular Harry Potter Series. Although not human, these characters clearly illustrate tendencies that do exist in us all, at least in small part. Citing classics such as “The Scarlet Letter” and “Pilgrim’s Progress.” Mellinger does an exemplary job of illustrating how even with the best of intentions, we can quickly and easily become introspective instead of focused on Christ. With a close look at selfies and social media, Mellinger examines how focus can shift from Christ and others to self. Mellinger tackles the chore of finding balance with regard to self evaluation. He provides tools and practical advice for avoiding over analysis. He encourages embracing God’s grace and forgiveness, while continuing to address areas in which we need to grow. Mellinger reminds us to find the joy in what we do. If we are so intent on ourselves and our “performance” we will miss the pure joy we can find in living God’s word. Minutes spent reflecting in how many mistakes you made during the day and all that you didn’t get done are moments lost that could be spent praising the Lord for all the good in your day. Think Again challenges us not to stop self evaluation, but to do so with a higher purpose, allowing a much more joyous and productive outcome. Among the many tools Mellinger discusses for Christ centered self awareness are gratitude and community. Think Again is an excellent opportunity to find more grace, more peace, more acceptance; all thanks to the love and guidance of God. Filled with practical advice and poignant real life and literary examples, Think Again empowers the reader to become more Christ centered in our self evaluation. Mellinger has also provided “Questions for Reflection and Discussion” at the end of each chapter making this an excellent choice for group study! Thank you to Litfuse Publicity for sharing this publication with me.